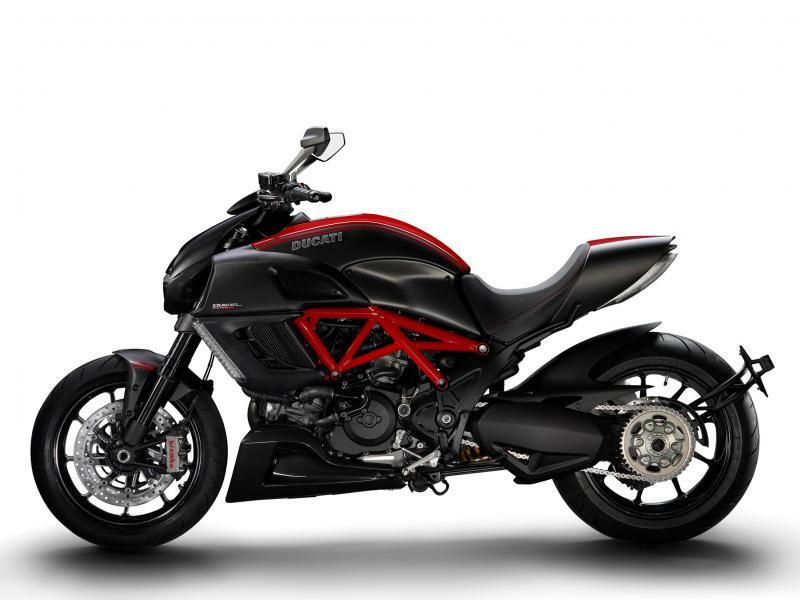 Ducati Diavel Carbon is a trendy sports bike which has created hype by its stylish looks and latest technology. Explore the review to get the features, technical specifications & price in India. 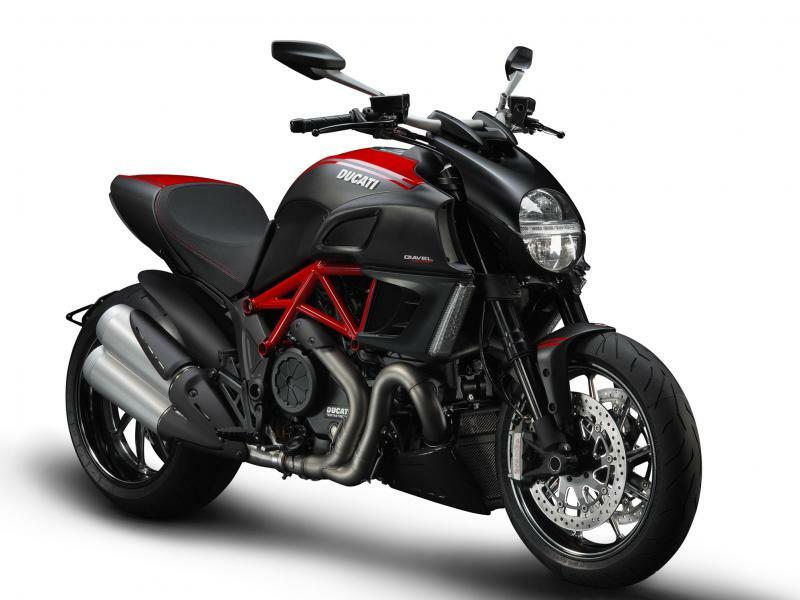 Ducati Diavel Carbon has created a new hype with its adventures bike which serves as an eye catching element. This super luxury bike comes with all the latest technology which makes the rider enjoy the driving at most. The speed thrills and the greater vehicle grip provided assures an enjoyment but with most safety features. Equipped with powerful engine and sound body the bike for sure serves as a main attraction on road. This new cruiser bike holds the rigid aerodynamic design which is the major plus point of the vehicle unlike others. The dynamic and trendy sports bike Ducati Diavel Carbon is powered by efficient 1198.4 cc, L twin cylinder with 4 valve per cylinder. The Testastretta engine comes with 11° inclination which helps to improve the fuel efficiency and also assures smooth fuel combustion. The maximum power generated from this engine is about 119 kw @ 9500 rpm and the highest torque achieved is 127.5 Nm @ 8000 rpm. 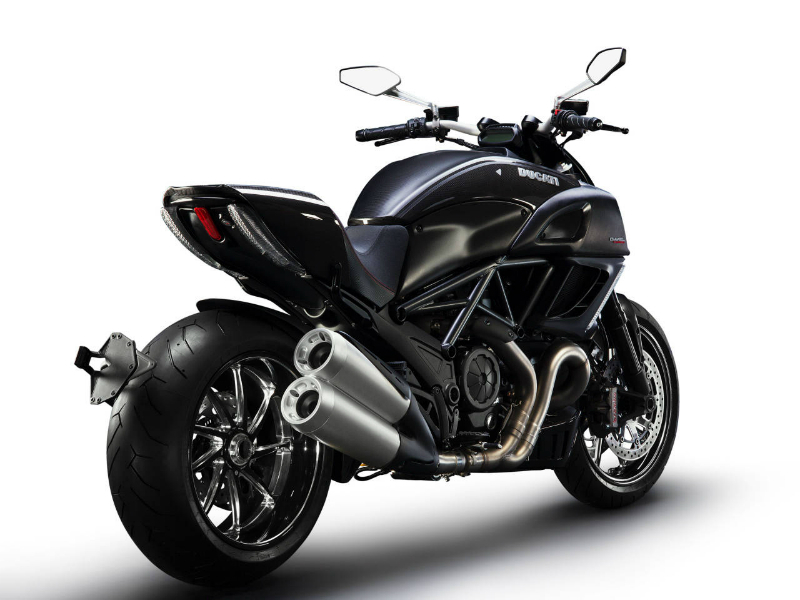 The well structured body of Ducati Diavel Carbon helps to build a strong relationship between man and the bike. The good-looking bike with the trendy curves and fancy graphics on the body is ready to create hype on every other enthusiast. The chilling and bold appearance of the bike is so fantastic that it for sure serves as a head turner. The comfortable seating position and broader wheels make sure that every rider enjoys the drive without any problem. Designed with all the latest technology and quality materials riding Ducati Diavel Carbon is truly a delightful experience. The new technology suspension system namely front Marzocchi DLC coated 50mm fully adjustable usd forks and rear progressive linkage with fully adjustable sachs monoshock and aluminium single-sided swingarm assures a smooth, trouble free ride and also help to provide greater stability and control. The fashionable alloy wheels with larger wheelbase is other noted point as it gives great control to the bike even off road. Further the vibrant braking system with ABS facility both at the front and rear wheels adds to quality driving. This petrol vehicle gives the mileage of about 10 kmpl however the mentioned figure may vary with the type of road. The all new stylish bike Ducati Diavel Carbon is available in two different shades namely red and matt carbon, glossy and matt carbon.